Tuesday’s election wasn’t a complete rejection of climate action and the promise of the low-carbon economy. Indeed, in the decisive defeat of California’s Proposition 23 and the re-election of Senator Barbara Boxer, both ideas have salience in the nation’s largest state. Nevada Senator Harry Reid was re-elected and his party retained control of the Senate with several races still undecided. In deciding to outspend the oil industry by a three-to-one margin, investors and executives in California’s clean energy and clean-tech companies succeeded in defeating Prop 23, which would have suspended California’s four-year-old climate action law, and hurt the state’s expanding market for clean energy and energy efficiency tools and practices. Now that the battle is won, California will continue to attract billions of dollars in research and start-up funding and retain its stature as one of the world’s principle centers of clean energy innovation. Moreover, along with Democratic Senator Boxer’s victory, which appears to ensure she retains the chairmanship of the Senate Environment and Public Works Committee, another climate advocate, Democratic Attorney General Jerry Brown, was elected governor. There is no doubt, though, that achieving those goals got harder. Republicans, too many of them campaigning on messages that denied the scientific authenticity of climate change, and raising doubts about the cost of moving away from fossil fuels, swept House races, gaining 60 seats. Republican in the next Congress will have a 239-196 majority. Politico reported this morning that at least 30 Democratic House members who voted for the 2009 House cap and trade bill were defeated. The White House, though, asserted that many of those races involved freshman Democratic lawmakers who’d won in 2008 in traditionally Republican districts. The NRDC looked at the results from a different perspective and concluded that of the Democrats who voted for the House energy and climate bill who were up for re-election, 162 out of 195, or 83 percent won or are winning. Of the Democrats who voted against the bill and were up for re-election, 21 out of 36, or 58 percent lost. Republican candidates in every region also criticized the $100 billion in clean energy, efficiency, and rail investments in the 2009 stimulus as an ill-advised government gambit to “pick winners and losers.” Voter tallies in every region except California clearly indicated that message also resonated. Virginia Democratic Representative Rick Boucher, a ranking member running for his 15th term, lost to Republican Morgan Griffith, who persistently raised” the stimulus and Rep Boucher’s cap and trade vote as a threat to the state’s coal mining industry. Florida Republican Charlie Crist, who as governor encouraged solar and the alternative energy development as a safeguard to climate change, was soundly beaten in the Senate race by Tea Party candidate Marco Rubio, a clean energy opponent who denies industrialization is warming the planet. Minnesota Democratic Representative James Oberstar, an 18-term lawmaker, a premier public transit and rail advocate, and chairman of the House Transportation and Infrastructure Committee was beaten by a Tea Party candidate, Chip Cravaack. 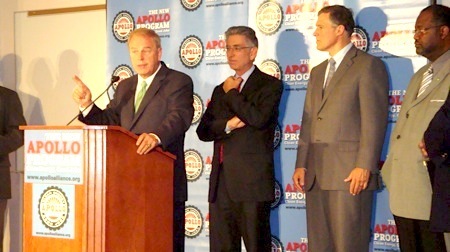 And in Ohio, Democratic Governor Ted Strickland (speaking in pix above from a 2009 Apollo Alliance news conference), who led his state through a grueling effort to approve one of the nation’s best renewable energy standards and prompted billions in new manufacturing sector development in wind and solar markets, was defeated by former Republican Representative John Kasich. Kasich vowed during the campaign to roll back the renewable standard. As I’ve noted, next year will be tough for climate action in Congress and the states. There may be some relief in knowing that a few House climate bill supporters won close races, including Democrats Brad Miller of North Carolina and and John Yarmuth of Kentucky. “Speaking of the lion’s den – he did this in the heart of Kentucky, a leading coal producer,” said Jeremy Symons, senior vice president for conservation and education at the National Wildlife Federation. Given the dearth of new economic strategies that make sense and actually work, it’s appropriate to again take note of what’s happening here in my home state of Michigan around clean energy development. The more you think about it, the clearer the significance of what Governor Jennifer Granholm (with the president in pix above at July 15 groundbreaking of a new lithium-ion battery plant in West Michigan) has accomplished becomes clearer and clearer. In short, one of the important and unsung low-carbon economy success stories in the United States, one that’s been shaped by a fortunate convergence of state and federal investment, is rapidly taking shape in Michigan. More than 40 new plants have been built, are under construction, or approaching ground-breaking to manufacture components for wind and solar energy, and to scale up Michigan’s electric vehicle sector, particularly the construction of new manufacturing plants to make dense, powerful lithium ion batteries. Some $9 billion has been invested — $6 billion for next generation electric vehicles, $3 billion for solar, wind, and other energy alternatives – which represents a mix of private capital, state tax incentives, and federal grants from the 2009 American Recovery and Reinvestment Act. Gov. Granholm asserts that the first phase of the state’s industrial redevelopment already has produced over 3,000 new jobs and will soon produce 86,000 more. This morning, just days after Senate Majority Leader Harry Reid announced that action on a proposed Oil disaster response bill would not occur at least until September, and advocates worried it may not happen at all, Gov. Granholm appeared at a clean energy briefing in Washington at the Center For American Progress. She was asked what she would do to advance comprehensive national climate and energy legislation. 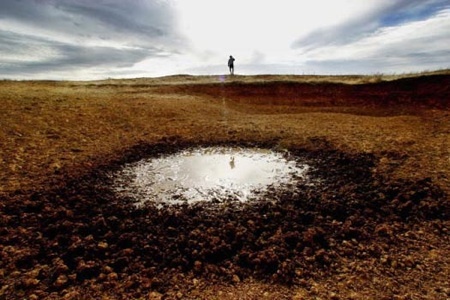 Over the last eight weeks, as the work to achieve a comprehensive national climate and energy policy devolved from President Obama’s “new national mission” to no bill at all, the reasons for the collapse have been turned over and again like a compost pile. The environmental community mounted a multi-faceted campaign in and outside Washington to accomplish its goal of cooling the planet. It hasn’t worked at the federal level. Gov. Granholm’s advice is to focus on heating up the economy. We ought to think hard about embracing the counsel more than we have. Michigan has served for years as a warning sign for the economic and social dysfunction that occurs when major industries and government utterly fail to keep pace with changing markets. It still has the second highest unemployment rate in the nation. Yet since the signing of the federal stimulus bill in February 2009, the state has emerged, arguably, as the nation’s clearest example of the real progress that can be made in job growth, modernization, and carbon emissions reductions when industry and government collaborate to command a new market. In a nation where people care most about either finding or hanging on to a good job, isn’t that the best way to reach voters and the political leaders who represent them? As cities on the East Coast sweltered in the sort of dispiriting record-breaking heat that climate scientists accurately predicted, the Obama administration’s lawyers were in a federal appellate court in New Orleans today to reinstate the moratorium on deep sea oil and gas exploration the Interior Department issued in May. Last month a federal district judge with investment interests in the energy industry struck down the temporary ban on new drilling. It’s been that kind of week. On the one hand, the Earth is exhibiting so many of the dreadful symptoms of an atmosphere unnaturally warmed by man. The National Snow and Ice Data Center said on July 6 that the expanse of Arctic sea ice had shrunk in June to the lowest level ever recorded. Asian climatologists reported that glacial melt in the Himalayas was accelerating. Record rains in Oklahoma and Arkansas in the last three weeks produced flooding that has killed more than 20 people. On the other, those who defend the fossil fuel industry and deny that the Earth has entered the era of manmade climate change press ahead with their dangerous work. Virginia Republican Attorney General Ken Cuccinelli is prosecuting a much-disputed fraud investigation of climatologist Michael E. Mann, who served on the University of Virginia faculty for six years. The idea to prosecute climate scientists was first introduced by Oklahoma Republican Senator James Inhofe, who in February issued a report that identified several respected climate scientists as potential criminals. 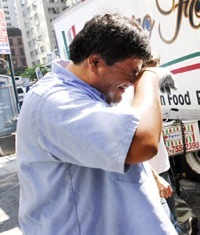 One of the accused was Dr. Mann, who now conducts his research at Pennsylvania State University. Cuccinelli based his investigation on a number of email messages, authored by Mann, and stolen in November from a data bank at the Climate Research Unit of England’s East Anglia University. A spokesman for the attorney general says Cuccinelli is scheduled to make his next court filing on July 13 in a case that the university, the American Association for the Advancement of Science, and 255 members of the National Academy of Sciences say is tantamount to a scientific witch hunt. That charge gained substantial credence over the last seven days. On July 1, for the second time since February, a Penn State investigative panel that also looked at the stolen emails confirmed the quality of the climate science that Mann conducted. And on Wednesday, an independent investigative panel commissioned by East Anglia University was the third and latest independent British review committee to clear Mann and other scientists who wrote the email messages of any dishonesty, ethical lapses, or unsound scientific practices. “We find that their rigor and honesty as scientists are not in doubt,” said Sir Muir Russell, the panel’s leader. President Obama and Senate Majority Leader Harry Reid are pushing the Senate to introduce, debate, and approve comprehensive energy legislation this year, and preferably before the August recess. The BP Gulf calamity, record East Coast heat, and dangerous heartland rain are unmistakable signs of the rising costs of a fossil-fueled economy and inaction on climate change. The exoneration of climate scientists and their important research ends legitimate questions about the causes of the warming planet or its fate if nations do not respond. The urgency to pass a comprehensive climate and energy bill in the United States increases by the week. Very plainly, the moment is here for the Senate to act. Well, now the Senate is getting into the act, at last. Bolstered by new opinion polls and driven by a monstrous blowout that is closing Gulf Coast beaches at the height of the travel season, Democratic leaders stirred into action this week to develop and pass comprehensive climate and energy legislation. They’re following, of course, the president’s lead. On Wednesday President Obama concluded an all hands cabinet meeting at the White House by publicly declaring again his resolve to develop a “new energy strategy that the American people desperately want.” The next day Democratic Senators caucused, apparently with considerable enthusiasm, to discuss the outlines of a comprehensive proposal to introduce and pass before the August recess. With the president and Senate Democrats motivated in a way they haven’t been before, could this be the season of energy policy making that has eluded presidents and Congress for 40 years? Maybe. The gears of legislative action have swung into motion and there is the scent of inevitability in the air, which is what big bills need to get approved. There’s also the Republicans, who were wounded last week by Texas Representative Joe Barton’s apology to the BP chief executive. But they aren’t dead. They’ll revert to form and attack limits on carbon emissions and clean energy development as a government overreach that raises costs. The Democrats and environmentalists should have a ready answer to both. Here’s why. The April 20 Deepwater Horizon explosion that killed 11 workers and the helplessness of the government and BP in controlling the blowout has reacquainted Americans with the colossal hazards of a nation so devoted to a single fuel. The BP Gulf disaster is more evidence of what candidate Obama described on the day he announced his campaign for president as the “tyranny of oil.” It is the latest body blow – the others include 9/11, Katrina, and the Great Recession – that stem from a common source: the nation’s fruitless 40-year struggle to take efficiency seriously and to develop cleaner domestic sources of energy. Republicans frame their critique strictly around prices and Government action. But how much higher do the actual costs — erratic fuel prices, climate effects, national security risks, lost jobs, depleted savings, diminished home values, and the sense of a crumbling way of life — need to go before the country responds? Maybe we’ve arrived at that place where costs of doing nothing and the benefits of pursuing a new development strategy around cleaner sources of energy have tipped far enough to merit a big policy response. Democrats are fortified by the results of public opinion polls that find strong support for a new energy and climate policy. One of the most significant was a survey of 1,000 people released this week by the Wall Street Journal and NBC News. It found that by a margin of 63 percent to 31 percent, Americans favor comprehensive energy and carbon reduction legislation. The survey’s findings were consistent with a burst of other national poll results in recent weeks, which also found that public support for new offshore exploration has steadily declined since the start of the BP disaster 67 days ago. The energy industry and its allies in government will not give up easily, we also saw this week. U.S. District Judge Martin Feldman, who sits on the Louisiana federal bench, this week struck down the six-month ban on deepwater oil drilling that the Obama administration established late last month. Federal disclosure reports showed Judge Feldman invested heavily in oil industry assets, including holding and recently selling stock in Transocean, the company that owned and operated the Deepwater Horizon under contract to BP. On Tuesday, a bipartisan group of senators meet with the president about energy legislation, which could be introduced next month. Monday, in the parlance of Washington policy and journalism, was scheduled to be a potential day of breakthrough in the work to achieve action on the warming climate. Senators John Kerry (Mass. ), Lindsey Graham (S.C.) and Joe Lieberman (Conn.) had announced that they’d come to consensus on what a bipartisan energy and climate policy fit for the 21st century looked like. The results were to be unveiled at a news briefing that had global import. Instead nothing happened. It was like reeling in a sailfish, all fight and silvery splash, only to have the beast die on the way into the boat. This is the third time in five months that that I’ve been involved in climate and clean energy campaigns that culminated in less than they promised. “Just say no” is emerging as a far easier answer than saying yes to progress. In Copenhagen in December, nearly 200 nations gathered at the largest summit ever with the express purpose of reaching agreement on a climate treaty. Instead what they came up with was a novel accord that points in the right direction and may not achieve more than that. In Traverse City, a small utility’s bid to acquire 30 percent of its energy from local renewable resources, including a state-of-the-art clean right-sized clean burning 10 mw wood biomass plant, generated such fierce hyperbole about unfounded risks among some environmentalists that you’d have thought the utility was proposing a 100-acre toxic waste site for the middle of town. The local push back, led by a grassroots environmental group, is consistent with similar resistance in 30 other states to proposals for new wind, solar, geothermal, wood biomass, and transmission lines. This week, Interior Secretary Ken Salazar is expected to decide on a big offshore wind farm in Massachusetts that has been the focus on a popular opposition campaign. The clean energy transition may not be televised. Now comes the Senate’s attempt to push through a climate and energy bill, which over the weekend got washed up on the shoals of partisanship, immigration policy, Senate Majority Leader Harry Reid’s re-election, and the powerful climate change-denying communications machine operated by America’s fossil fuel collective. Today, Senator Reid retreated just a bit and sought to assure his Democratic and Republican colleagues that debate on the climate and energy bill would come before debate on the immigration bill. That makes sense since there is no immigration bill to debate in the Senate. But Graham, a very lonely Republican in the climate and clean energy space, has not yet indicated whether he’s ready to participate in introducing the ready-to-go energy bill that he’s spent months shaping with Senators Kerry and Lieberman. The politics of stasis — of doing nothing — is brought action on climate change to a crawl, and that may be kind. The public will to act, to reduce emissions of carbon, to provide for the safety of the planet and all its inhabitants, is just not apparent in the United States, or in much of the rest of the developed world. Greenhouse gas emissions from human activities are increasing. Between 1990 and 2008, there has been about a 14 percent increase in emissions in the United States. Average temperatures are rising. Seven of the top 10 warmest years on record for the continental United States have occurred since 1990. Tropical cyclone intensity has increased in recent decades. Six of the 10 most active hurricane seasons have occurred since the mid-1990s. Sea levels are rising. From 1993 to 2008, sea level rose twice as fast as the long-term trend. Glaciers are melting. Loss of glacier volume appears to have accelerated over the last decade. The frequency of heat waves has risen steadily since the 1960s. The percentage of the U.S. population impacted by heat waves has also increased. Still, people in the United States aren’t much concerned. They are clearly indicating, in grassroots fights and in support for lawmakers who counsel to do nothing, that they are satisfied with the way things are. That is a dangerous sentiment in an unsettled world making powerful and swift transitions in every important sector — the economy, markets, the environment, energy, population, and competition for resources.